WARSAW, Nov 22 2013 (IPS) - Power generation is a major contributor to the greenhouse gas emissions that cause global warming. Choosing the right options for less-polluting energy sources in the future is a vital question – in which energy-starved Africa has a keen interest. In one camp, highly polluting industries are appealing for support under any new climate finance mechanisms established under the United Nations Framework Convention on Climate Change process. Coal is all but synonymous with greenhouse gas emissions, yet the industry says it believes it has a place in a low-carbon future. The World Coal Association’s chief executive officer, Milton Catelin, said low-emission coal technologies, which are already available in the market, could help the industry reduce emissions by 20 percent. “This is equivalent to the carbon dioxide emissions of India,” said Catelin. 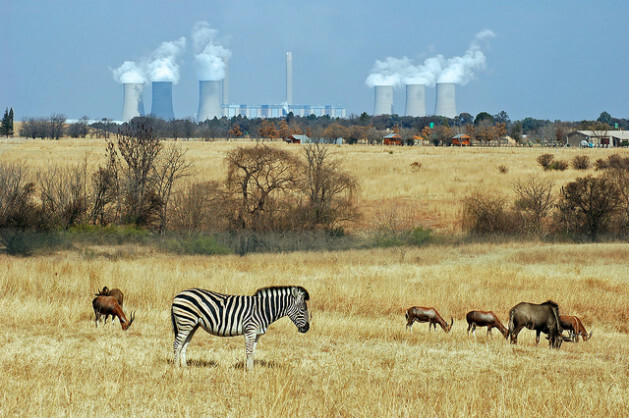 According to Godfrey Gomwe, the chief executive officer of Anglo American, one of the world’s largest world mining and natural resources firms, the coal industry needs to develop better clean technologies to reduce greenhouse gas emissions. But who will pay the costs of this research and development? Development banks that could finance this are shying away from such projects, Gomwe told the Coal Summit, held on Nov. 19 on the sidelines of the U.N. Climate Conference. “Coal’s role is likely to grow in many places, regardless of whether development banks are involved or not,” he said. The WCA says that 41 percent of electricity generation worldwide comes from burning coal. While admitting that the coal industry was responsible for a significant proportion of total greenhouse gas emissions, Gomwe said it was wishful thinking to imagine coal would simply disappear as demand for power doubles over the next three decades. The argument in favour of helping polluting industries clean up their act is hitting home for some. The first executive director of the Green Climate Fund, Héla Cheikhrouhou, said the Fund would include a “private sector facility” which will focus on funding businesses to develop cleaner technologies. Funding for the GCF, the new multinational fund created to manage the money pledged towards long-term climate finance for the developing world – the target is 100 billion dollars a year by 2020 – remains uncertain. Many civil society organisations flatly reject the idea of climate finance for the very industries whose emissions are responsible for creating the climate crisis in the first place. “The notion of clean coal is as false as the notion of clean cigarettes,” Greenpeace International executive director Kumi Naidoo told IPS. He said the coal industry is promoting technologies such as “clean carbon and storage” as though it already exists, when in fact it will take decades for the industry to develop these innovations into effective techniques for commercial use. He wondered why governments would invest in something that might ultimately be impossible to achieve when there is evidence that renewable energy sources can provide sufficient energy. “It is a myth that renewable energy sources are insufficient. There is evidence that in Africa alone, we haven’t even tapped into one percent of renewable energy sources,” said Naidoo. Mark Lutes, the Climate Finance Policy coordinator for the World Wide Fund for Nature, agreed that instead of investing in so-called clean technologies for coal, more funding should go to research and innovations in renewable energy. Governments of poor countries are also calling for investment in renewable energies as opposed to supporting polluting conglomerates to continue burning coal. The manager for environmental safeguards and compliance at the African Development Bank, Anthony Nyong, agreed that renewable energy sources are not given enough attention. He said Africa needs a lot of energy to drive its development but the continent lacks access to clean technologies that would allow the sector to grow sustainably. “Take solar energy, for instance. Africa has the sun in abundance and could be generating a lot of energy from this source if there was a lot of research and innovation going into this sector from within the continent,” said Nyong. Addressing the Coal Summit, UNFCCC executive secretary Christiana Figueres also urged the industry to diversify its portfolio beyond coal. “Some major oil, gas and energy technology companies are already investing in renewable and I urge those of you who have not yet started to do this to join them,” said Figueres. She said the coal industry has the opportunity to be part of the worldwide climate solution by responding proactively to the current paradigm shift.